Yep we have defended the title another year – but please don’t BOO the Zoo, we are always up to stuff even if we don’t do the twit-twoo or bookworm… We just don’t always feel inclined to boast about our little triumphs, or for that matter, witter on when obstacles stymie our plans. However, we hereby make a nearly new year’s resolution to post at least once each month with current news AS WELL AS backfile at least one post about past adventures… OK? "Elliot's Hoody", 2nd edition art print (reworked design) - Screenprint, 3colours - Original edition printed in 2009 for an exhibition at Signed & Numbered in Salt Lake City ... more details to follow, probably. Not enough? Ok, well we also promise to watch all the blooming “webimars” (daft word) to actually get the long awaited mailing list out and past those blasted spam filters… be patient, we are into the ACTUAL rather than the virtual …dig? …okeydokey! …it even has a treelined seaview! yes yes! More news about that next month – we promise! 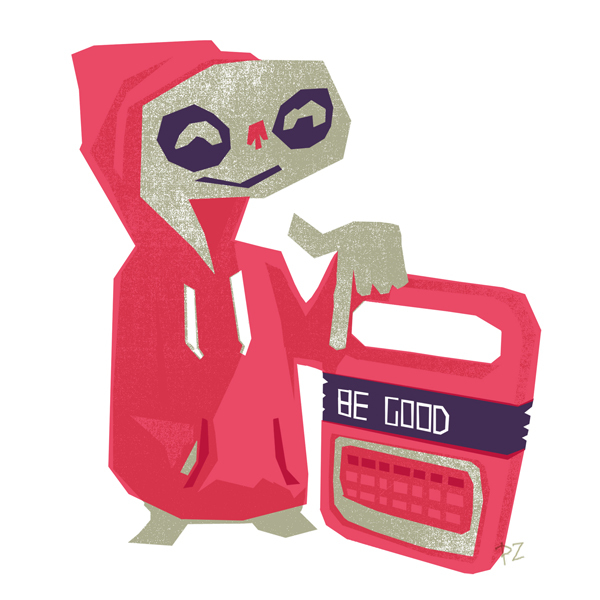 This entry was posted in Exhibitions, Screenprints, Uncategorized and tagged affordable art, BE GOOD, blog, blogging, E.T., E.T. artwork, Petting Zoo Prints, resolutions, Salt Lake City, screenprint, serigraph, Signed & Numbered, Speak & Spell, studio. Bookmark the permalink.